The past week has been off the charts as far as things related to the end times are concerned. Russia starting airstrikes in Syria, Iran sending in ground troops, the Pope proclaiming that he comes “in his own name”. It’s been absolutely crazy exciting so far, with no end in sight. 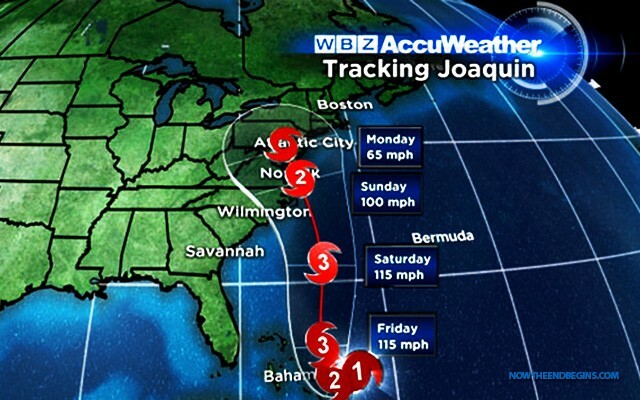 That brings us to the topic of today’s story, Hurricane Joaquin. Governors in Virginia, Maryland, New Jersey and North Carolina have issued a State of Emergency. I thought it unusual for the hurricane watcher people to pick a Spanish name, and it got me curious as to the meaning of that name. When I went and looked it up, I about fell off my chair. According to the name meaning web sites I visited, the name Joaquin means “Raised By Yahweh“. Huh, are you kidding me? “raised by Yahweh”? Look, folks, maybe this storm will fizzle out and maybe it won’t, but at this point I really feel that the Lord God of Abraham is sending us a message. When you have the combined assembled nations of the world thumbing their nose at Him, raising the flag of Palestine and talking about dividing up His holy land of Israel, you got to know that judgment is coming. Look at where Russia and Iran are right now, and perhaps you will see that maybe judgment has already begun.